I have a little bit of an obsession with vintage magazines, as they provide so much inspiration and are just generally wonderful reads. My idea of a perfect relaxed day would consist of perusing Vogues, Harper's Bazaars and other magazines dating from the twenties to sixties, while drinking lots of just-ground coffee. 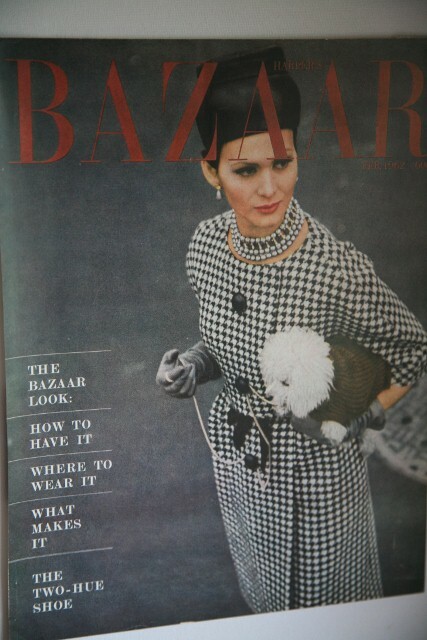 So for a birthday present last year, my mum bought me a set of sixties American Harper's Bazaar covers. I currently have ten of them displayed on three canvases on my wall... (Good for inspiring chic dreams!) A while ago, my mum commented on the fact that I had a dogtooth dress that I could use to recreate one of the covers (shown above). So this is my version! Okay, so the dog has been replaced with my brother's toy polar bear and I don't have any necklaces as extravagant as the one pictured, but I tried to represent everything in the photo! This dress is thrifted, and the buttons sewn on are vintage ones that we found at a market stall. The hemline was also taken up - thanks mum! The black vintage belt is family inherited, and so are the leather gloves. The faux fur hat in the first shot was thrifted, and so are the men's brogues which pop up constantly on this blog! Yes, I am obsessed with brogues.. The faux pearl necklace was rescued from a 'treasure box' of odd pieces of jewellery that my brother and I used to play with - we would pretend that we were pirates, then barter and exchange pieces with each other to create our perfect hoard of 'treasure'. Nothing like discussing the merits of swapping a broken brooch inscribed with the words 'Ladies Tennis Club Tournament 1953' with a single, delightfully tacky faux-diamond earring to bring out the entrepeneur in oneself! I love the light in these photos. The sun was just about to set, meaning there was that wonderful orange glow brushing every surface. Talking about amazing magazines, I watched 'The September Issue' yesterday, and decided that Grace Coddington is my new icon! Her sumptuously planned and styled shoots (especially that twenties inspired one!) were extraordinary. For anyone who has seen this documentary, what did you think of it? I'm sure there are some very interesting views on this film. Thank you for a number of blog awards I recieved recently, they are very much appreciated and will be properly attributed in a later post. This is part one of my latest shoot with the beautiful Emma. Having said latest, this happened at least a month or two ago.. That's how long it took me to pick the photos to post! 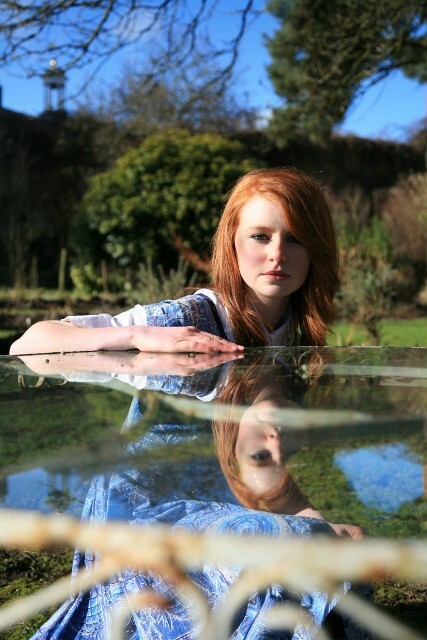 The theme for part one of the shoot was a cross between Alice Through the Looking Glass and The Secret Garden. 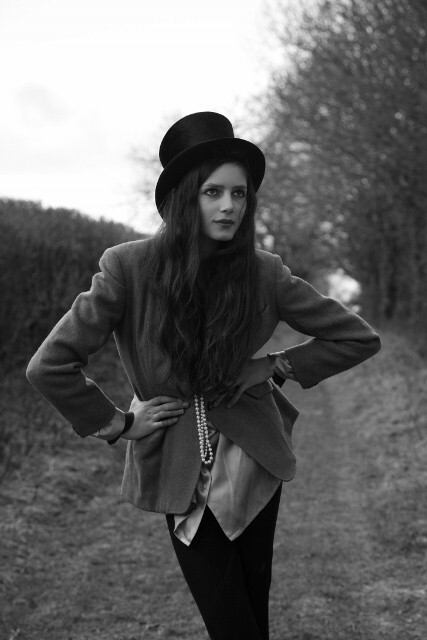 I wanted a very whimsical feel with my styling of the outfits I chose, to capture the fun but also the timelessness. I always find books a massive source of inspiration when I am given the chance to work behind the camera. Luckily, I found the perfect location - a stunning large garden with an arboretum situated right next to it. I used both parts for this shoot. Incidentally, I have visited from time to time and played on the swing pictured here ever since I was little. 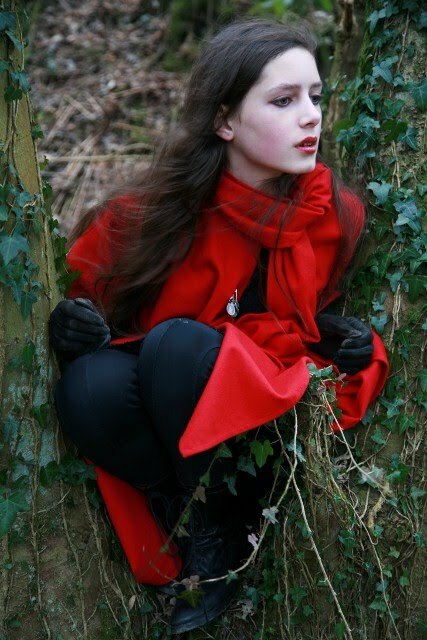 The first outfit is the Alice inspired one. We even had a cat who decided to stalk Emma around the garden and sneak into every photo I was taking! Either it loved the limelight, or just instantly adored my model (maybe both?) It got to the point where Emma had to pick up this cat and put it on the other side of the garden, then run back for me to take a photo before it returned. Anyway, this actually worked out rather well as it reminded me of the Cheshire cat from the Alice tales. Then the glass table served as a wonderful looking glass.. Emma is wearing a vintage fifties blue tea dress from Brick Lane over a thrifted shirt. I dug out these thrifted brown lace ups as I knew they would actually fit Emma. The various vintage necklaces are inherited pieces. 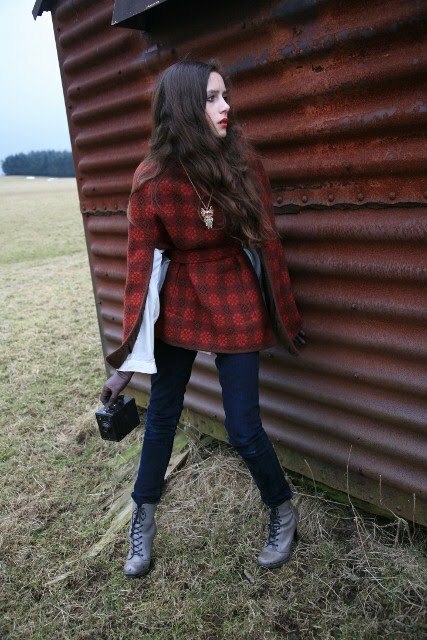 The jacket in some shots is a thrifted Karen Millen piece. I really like the structure and cut of it. 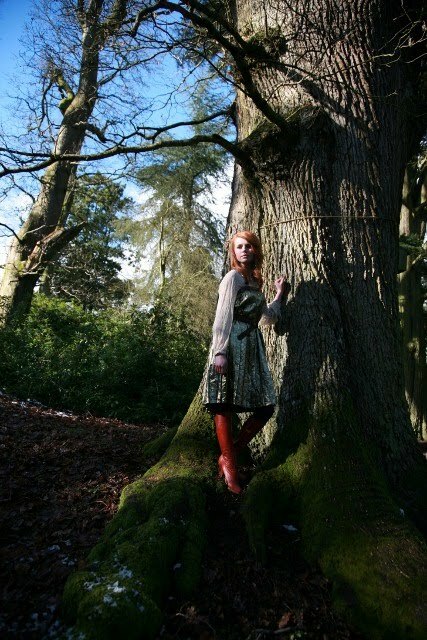 The second outfit was shot on and around this amazing tree that looks like it has run away from a fairytale to join this arboretum. The middle forms a kind of natural seat - I would happily sit there and draw during summer. The black high waisted trousers are thrifted Laura Ashley (my mum's) and the little cardigan is thrifted Radley. I really like the lace detailing on the shoulders.. The shirt underneath is my mum's. And oh, what a surprise! Are those the white brogues I see before me? Again? Gosh, they do pop up on this blog a lot.. The clock pendant is from ebay and that black belt was inherited. I put Emma in the third outfit on a bit of a whim. 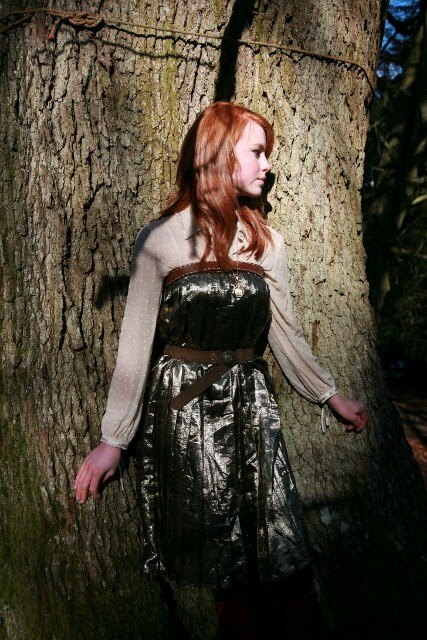 The gold pleated dress is actually a skirt that used to live in my dressing up box. I realised when she put it on that the top was much too wide, so I had to improvise with a thrifted Tommy Hilfiger belt to create an extra edging! The other belt (actually used correctly) was my grandma's when she was in the equivalent of the girl guides. Another piece I really love. The shirt is as before, and the vintage seventies boots were thrifted a very long time ago when I still had size three feet.. Emma adores them, but unfortunately I would never be able to part with them - sorry Emma! You can see the remnants from the last ever snow fall of this year in the background (Yes, I had to mention the weather at some point, I apologise for my slightly predictable British-ness) and the light was beautiful. A quick note: To clarify, I never edit/ photoshop my photos and all the lighting is natural! 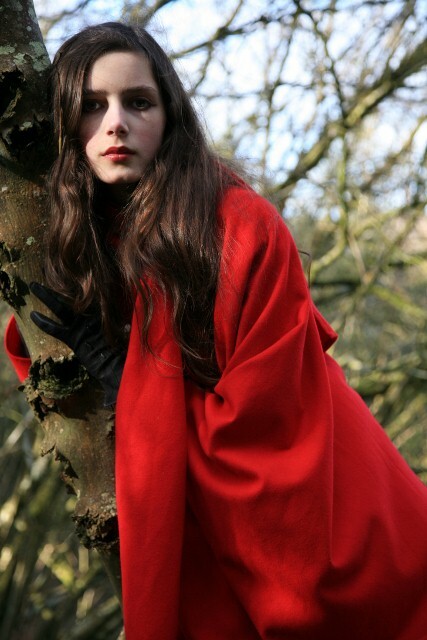 Let me introduce you to 'Red Riding Cape.' Sound familiar? 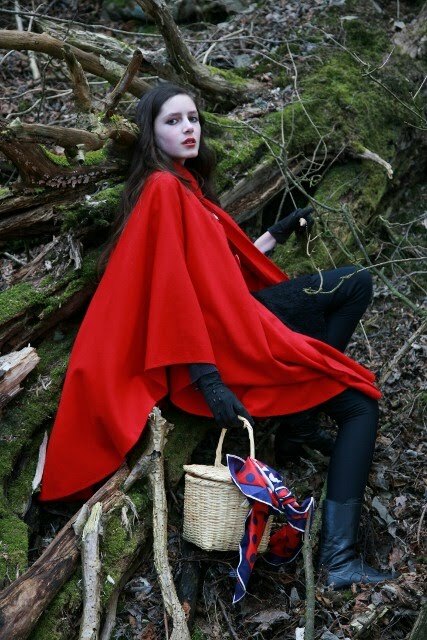 This is Little Red Riding Hood's glamorous auntie, and she practically invented her niece's brand daahling! 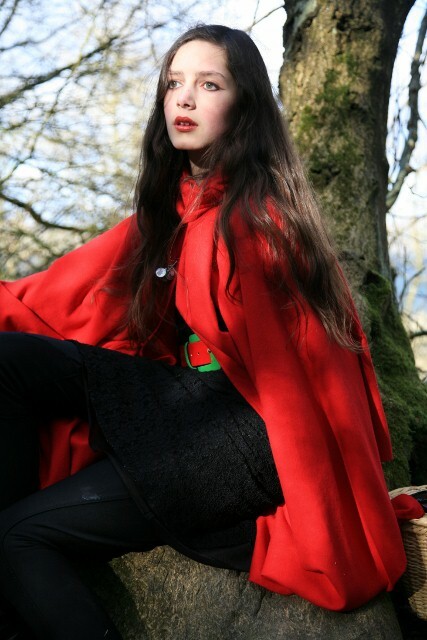 You see, whenever RRC (as I'll call her for short) decides that her new red cape is a little out of fashion, and she needs a new model then she gives the "hopelessly outdated" one to her niece - who then gets all the credit for apparently being the only person to wear said red cape in all of existence! 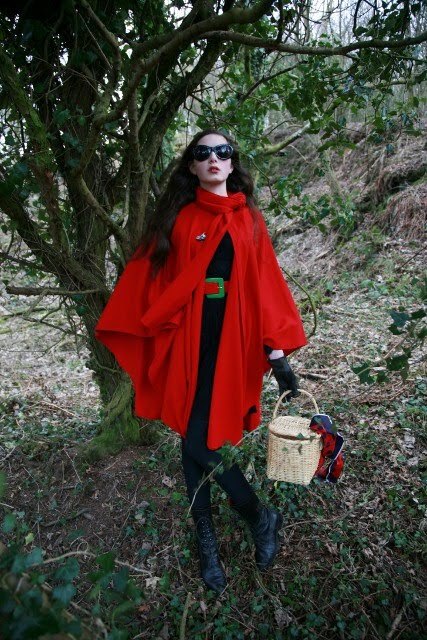 But don't believe the hype - Auntie is the woman behind single handedly bringing capes back into fashion, and of course she's rarely seen without her sunglasses and trademark red lipstick. 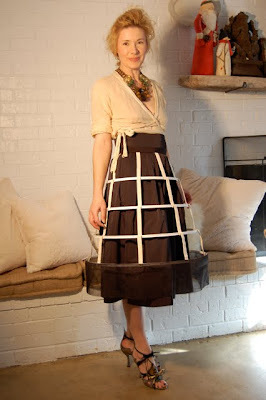 Oh, and don't you know that even the basket as an accessory was her idea first? 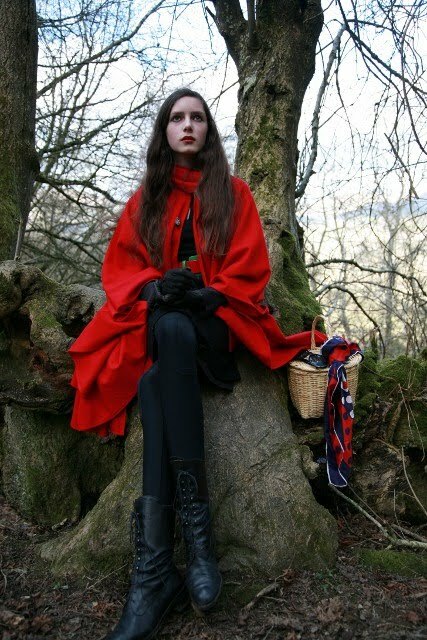 Of course dear, she hands those down to Little Red Riding Hood too. But this aunt isn't bitter about not having the recoginition she so obviously deserves, she just smiles to herself as she rests assured that she is the original trendsetter... Besides, she has a very good therapist. Sometimes when I do a shoot, I like to create characters to go with the outfits - it really helps me to think about poses and ideas. And I loved the idea of this character so much that I just had to share her! 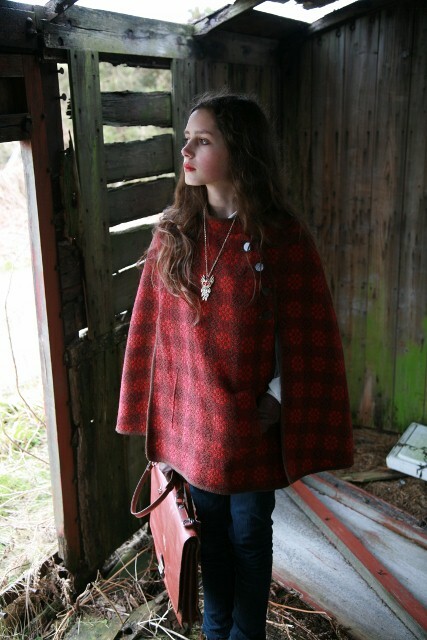 This red vintage cape was another ebay find ( Yes, Mum and I really have promised that we are not going to log in to ebay for a few months!) I really like the vivid colour, especially against the greenery of the forest. Underneath I am wearing a thrifted H&M lace dress (as the cliche goes, it fits like a glove) and a vintage belt that my grandmother wore in the seventies. Thanks Babi! 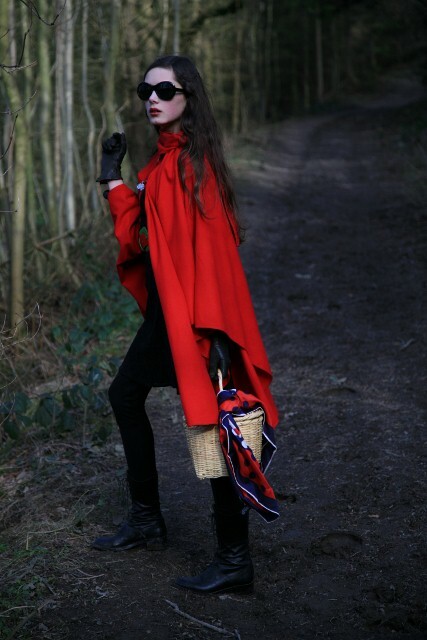 You may notice that I am still wearing jodhpurs underneath, as it was very cold so I decided to just keep them on. (This shoot was done just after 'Daddy, I want a pony') The lace up victorian style boots are my mum's, and take about ten minutes to put on... The basket usually stores hats in my room, and the silk scarf is one of a rather large collection that I inherited from my great-grandmother. The black embellished gloves are also from her. There is a brooch/ pin on the cape, which was my grandmother's. It is made up of a fascinating array of miniature objects, from a small cameo to some coins. I should have done a close up of it! These black jodhpurs have been languishing in my dressing up box for a number of years, probably ever since my last horse riding lesson. (I went through a bit of a horse phase when I was younger.) So imagine my surprise when I found that they still fitted! I quite like the fact that you can wear them in the same way as tailored trousers - they're even the perfect ankle grazing length daahling! I ended up wearing them around the house with a big jumper that evening. The new leggings maybe? The grey riding jacket was thrifted too, for £2! Finds like this make me happy, and reinforce my faith yet again in the old and well loved charity shop. 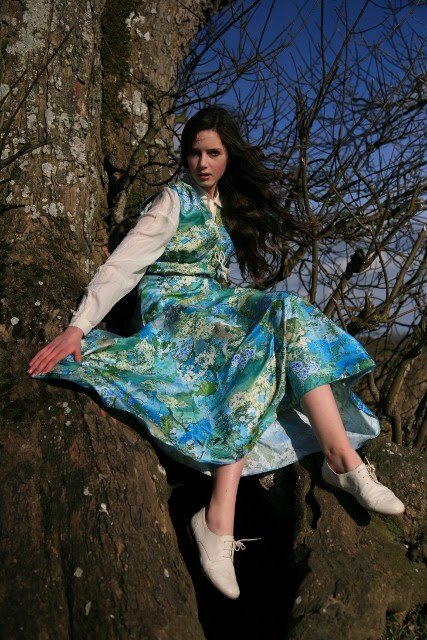 It is suberbly tailored and has a beautiful dusky turquoise satin lining. I'm not sure what era it is though. Any suggestions? The shoes were also thrifted, and are Italian made. They have this really pretty white stitching detail around the edges. I was given the vintage top hat for christmas and the necklaces have various origins. It was so windy when we doing the photos, meaning that half of the time I was frantically trying to halt large quantities of hair blowing across my face and making me look like some kind of smartly dressed werewolf! Thank you for all your sweet comments on my interview post, I'm sure Judy would appreciate them! (And so did I.) Also thanks to the Trendy Fashionista for giving me a blog award. I'm flattered..
Edit: I am going away for the weekend now, but I'm looking forward to catching up and replying to all those lovely comments when I get back! And in response to a few questions, the lighting in my photos is always natural. I have been poring over some of my fifties Vogues recently, sparking thought about vintage fashion and what it means to me.. This is a question I have always found interesting, so I thought I'd ask someone else for their view too. Luckily, the wonderful Judy Aldridge from Atlantis Home graciously accepted my request for a short interview about vintage, and here it is! What would say it is about vintage that makes it so desirable? Vintage makes your look truly your own. 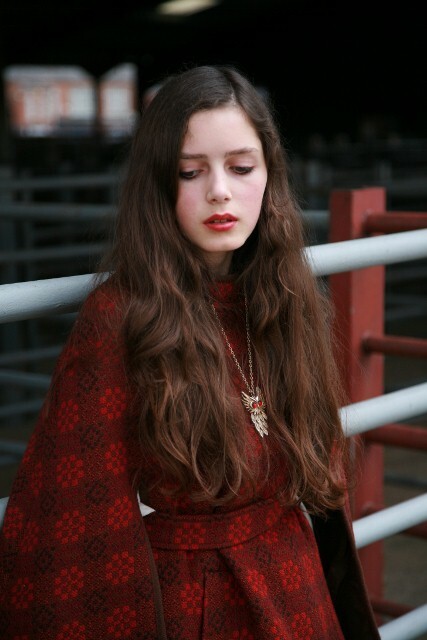 Clothes tend to be so homogenized these days--adding vintage is the best bet for a unique look. Do you have any favourite vintage designers? Yves Saint Laurent--definitely. I also like to stalk Vicky Tiel on eBay. 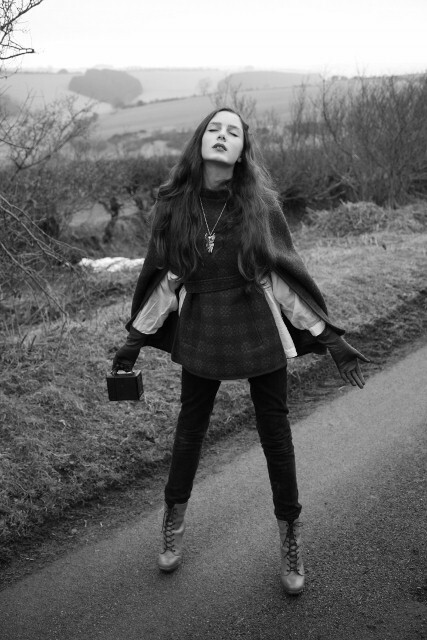 If you are buying vintage to wear yourself, where are your favourite places to purchase from? Decades is incredible, what goes around comes around in NY, thrift stores and eBay of course! I know you have a website that sells vintage. Do you sometimes find it hard to part with some of the pieces? (I think this would be my stumbling block, I'd never be able to sell anything on!) Not really--Usually when I purchase a piece I know if it is for me or for the site. There are pieces that don't sell at times, and I think to myself that they must be meant for me. What would you say is your favourite decade for design? Or do you have more than one? 70's and 80's. If you could own one iconic piece, what would it be? A piece from YSL's Russian collection. 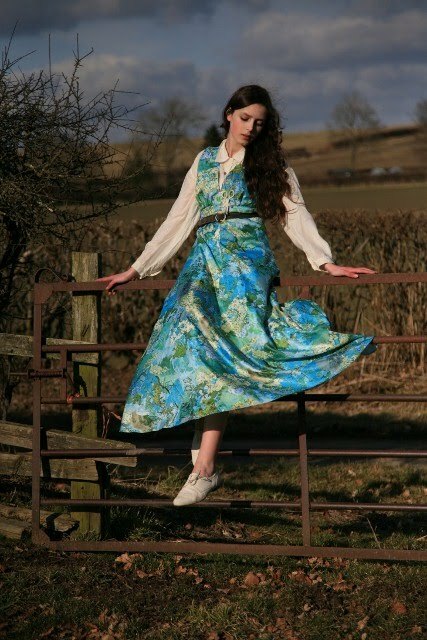 When did you first become interested in vintage clothing? And what prompted the interest? 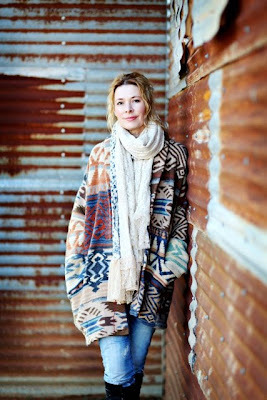 I started purchasing vintage clothing when I was about 16--so that was over 30 years ago. Wow--I'm old! My mom loved antiques and used to take me along shopping--I naturally started looking at vintage clothing at Antique Malls and Flea Markets. I know that Jane often borrows things from your wardrobe, and vice versa. 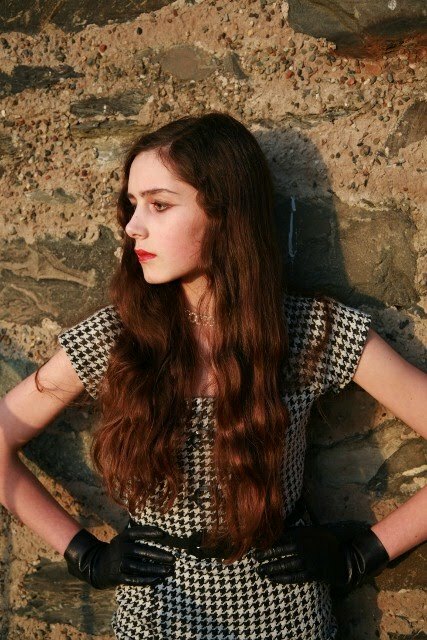 Would you say that looking at her personal style has influenced you in any way? Or do you influence her? I think we influence each other Greatly. Sometimes she shows me how to wear things in a way that I would not have imagined. I would be really interested to hear what some of my lovely readers' responses to these questions might be as well! I completely adore the forties draped silk piece I wore, and am trying to come up with a way to stretch my meagre budget to findng a similiar item. Copyright on the first image: Bertie's. 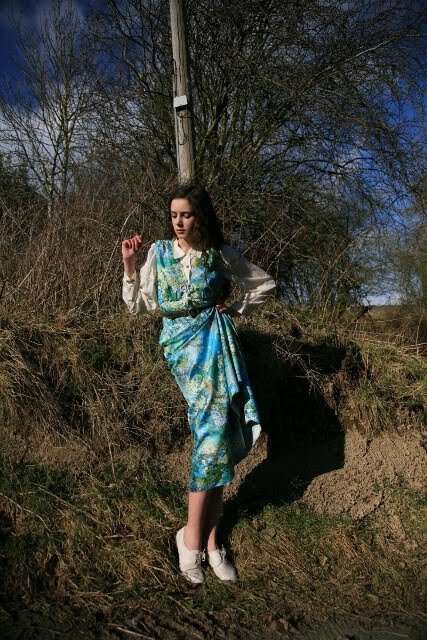 To start with, this vintage dress is handmade- one of a kind. And then you see the material! It has this amazing collage effect- like cuttings of plants and patterns taken from newspapers and stuck down in abstract formations. That's what makes it look so individually created, in the best possible way. The other thing that struck me when I pulled it out of the tissue paper was how much it reminded me of an Erdem piece. I think it's all the opulent florals that made me think of his distinctive fabric prints. 1- I am someone who finds it very hard to just put on one item and go. I like to think about layers and accessories, kind of making that piece of clothing my own. And 2- The temperature. Yes, that little beast I am constantly wittering on about. (Though as I pointed out before, in this respect I am just stereotypically British: weather obsessed!) Don't let this sunshine decieve you! The brogues are repeat offenders on this blog, being one of my most cherished pairs of shoes. But somehow this dress just didn't look right with heels. 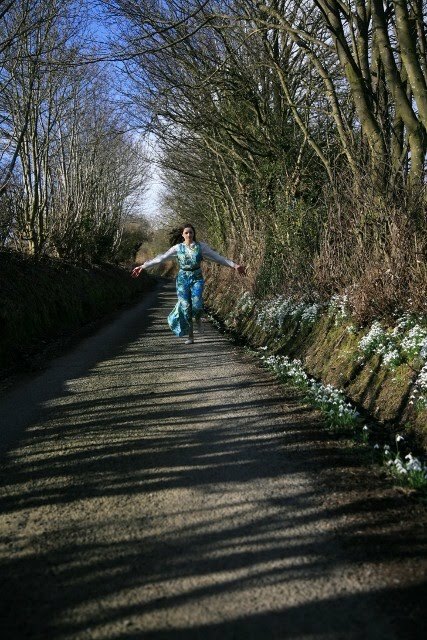 My original idea for the dress was to shoot it among the multitudes of snowdrops that have sprung up along the lane behind our house. 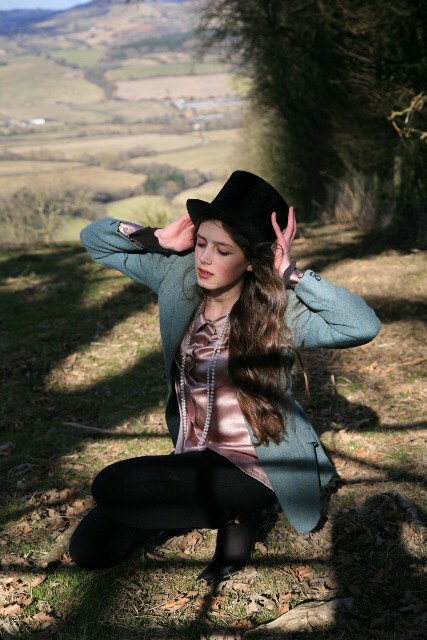 However, it was when my dad and I got to the top of the hill and found the wind that the photos got better.. 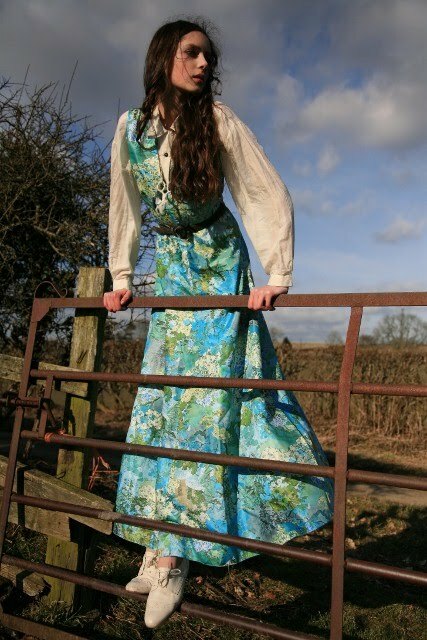 Blustery breezes and long dresses always make a great combination. Now, a big thank you to all of you who gave me book and poetry suggestions in my last post.. I am definitely going to act on some of that advice! It's always great getting your responses. Right, time to go and do my art homework. Ps- My blog archive is only showing my latest six posts on the main page, despite it being set to ten in my settings. Does anyone with more technology knowledge than me know how I could fix this? Or is anyone else experiencing this problem? Any suggestions would be much appreciated. However, yesterday (when these photos were taken), it was grey and cold. In fact, so freezing that I couldn't do up the laces on these boots with bare hands, as my fingers went numb. Unfortunately, I hate really cold weather. I'm someone who doesn't feel right if they're not warm enough- meaning I changed my outfit three times yesterday morning so I had the balance between not shivering and also being happy with what I was wearing. 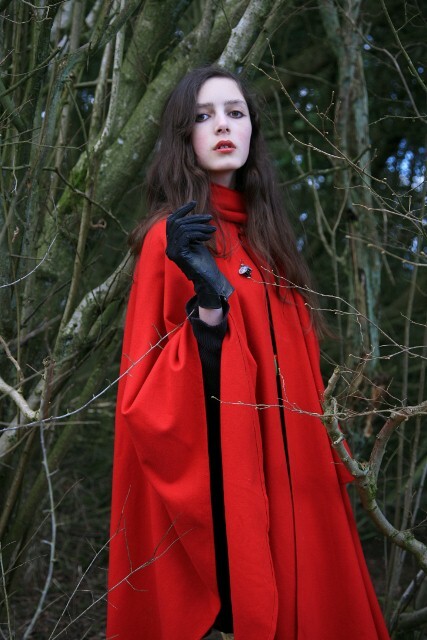 I finally ended up in my new cape, recently purchased off ebay. 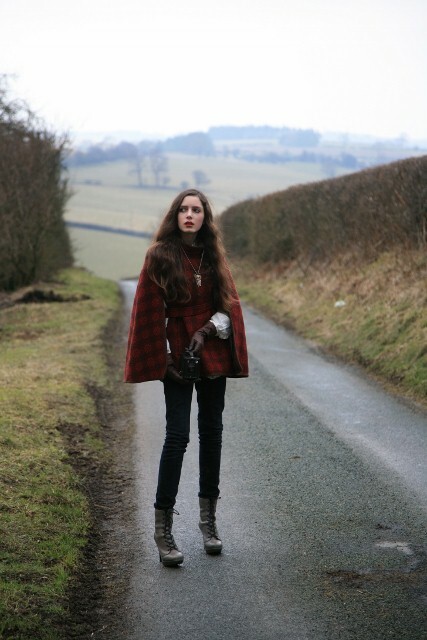 I love capes at the moment. They are like the coat's quirkier cousin- still just as warm but a little more unique. Here I am wearing the aforementioned cape, with a silk shirt underneath. What you can't see is that under this silk shirt I have on a vest, t-shirt, a long sleeved top and a thin Jaeger jumper. I then added skinny jeans. I have a feeling that this is only the second time I have ever been pictured in jeans on my blog. I do wear them quite a bit more than that, but somehow I just find shooting skirts and dresses more interesting! The grey lace up boots are my favourite pair from Topshop. And for five inch heels, they are surprisingly easy to walk in- when you are not tottering along country lanes more used to being frequented by tractors. The owl necklace is vintage and is kind of the nearest thing I have to a lucky charm. 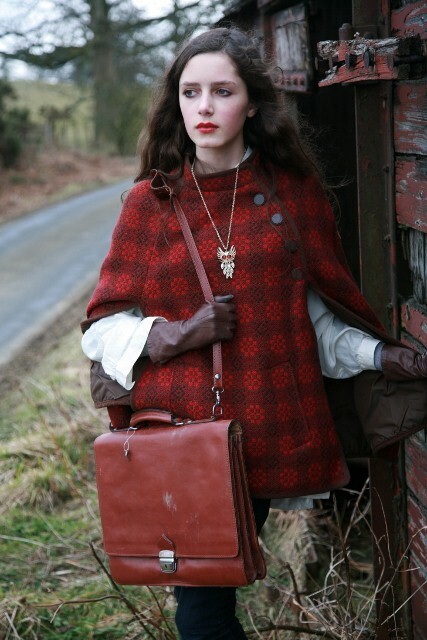 The brown leather gloves are family inherited, and so is the leather satchel. I bought the vintage camera in a charity shop on friday, and thought it would make the perfect prop here! I really want to start to learn how to shoot on film, but I'm not sure if this is the camera I'll be using as the instructions are all in German.. 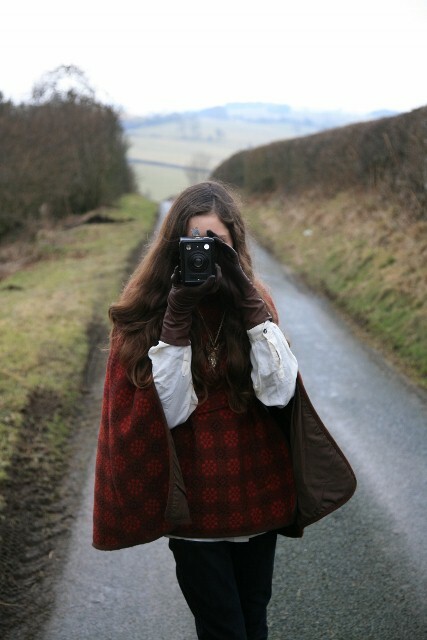 The photos were taken on an attempted family walk, but it was so cold that mum and little brother retreated to the car while we did important things with the camera. 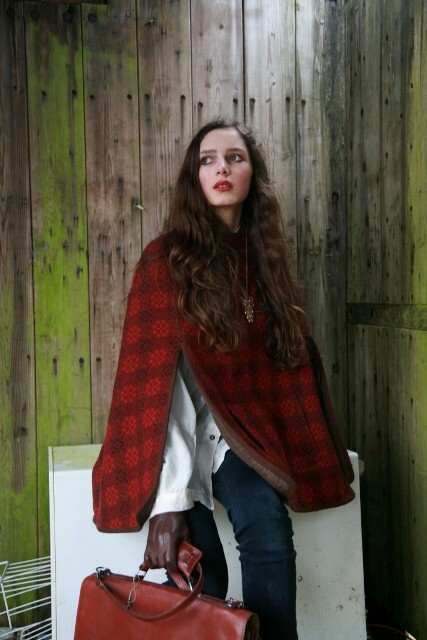 Nearby, we knew there was an old railway carriage that is now used as a sheep shed, and thought it would be the perfect location for this cape to be shot in. The alternative title for this is 'Caped in shades of rust', and that's exactly how I felt.. The vibrant colour worked so well in contrast with the outfit. What is amazing about a structure like this is seeing how much of the original shape is still there. Part of a door, huge rusting nails, still-working hinges. Such places feel like they are seeped in history. You start to wonder who else might have stood in that carriage when it was still in use, who has shared that space with you at some point in the past? "Old enchantments. Let them sleep. The hermit's chapel, the pilgrim's prayer." We have just started studying poetry in school, ready for a literature exam, and I was surprised by the number of people who groaned when we found out this was the next topic. On other matters literary, I realised most of the classics I've read recently are American- The Great Gatsby, Catcher in the Rye, My Antonia and now Nine Stories by J.D Salinger. This wasn't on purpose, but its been so interesting reading all of these books, and comparing them. But on to my question- does anyone have any classics (from any country) that they could suggest as my next book to read? I would love to hear your ideas. Oh & I'm happy to say that I had my six hundredth follower recently. Thank you to every one of you!